Tomatoes sweeten even more when baked. 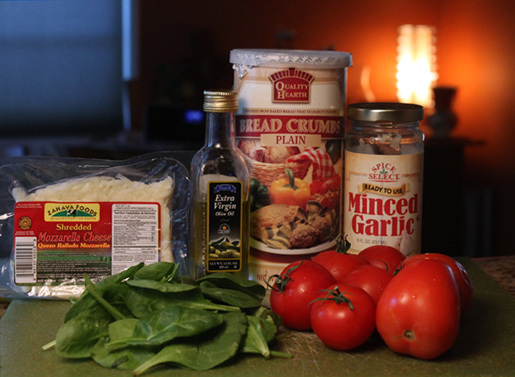 In the latest Cheapskate Chef recipe tomatoes are stuffed with cheese, breadcrumbs, garlic and spinach for a scrumptious vegetarian entree. Like bell peppers, all you have to do is slice off the tops or divide in half, then scoop out the seeds for a tasty container that can hold almost anything, even your favorite meatloaf mix (mine is here.) Baking caramelizes the tomato and the melting cheese mixes into the breadcrumbs and spinach to delicious effect. While tomatoes are not the cheapest fruit, they are always coming on sale. My local 99c only Store and my favorite Latin Market stock them at the right price. And if you plant a summer garden, definitely bookmark this recipe for harvest time. You can use pre-made breadcrumbs, but they are so easy to make you might as well do it yourself (my recipe is here,) because you can use more nutritious types of bread instead of plain white (try whole wheat and multi-grain sometime.) 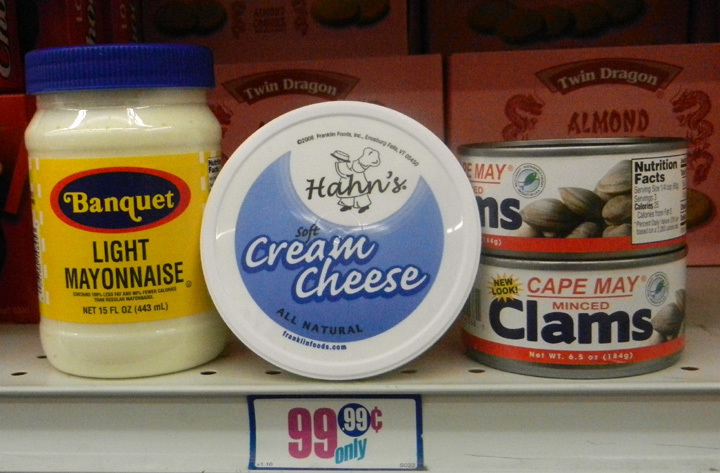 And any type of inexpensive cheese can be mixed in -- it's up to you. If you use large tomatoes then you have an easy-to-make filling meatless meal. If the tomatoes are small then they can be served as a accompaniment to the main course, or even as appetizers for your next gathering. 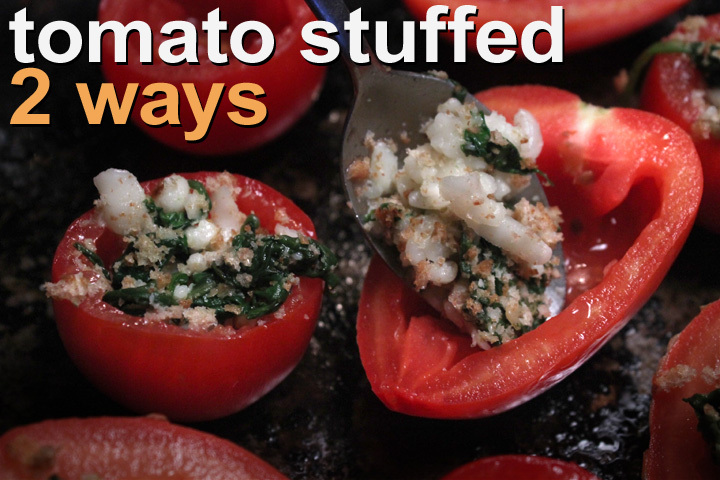 Now that it's colder, time to warm up the kitchen with an oven full of The 99 Cent Chef's Stuffed Tomatoes with Breadcrumbs, Spinach & Cheese. And this is a perfect Meatless Monday meal. 2 large tomatoes - I used about 6-8 small ones. 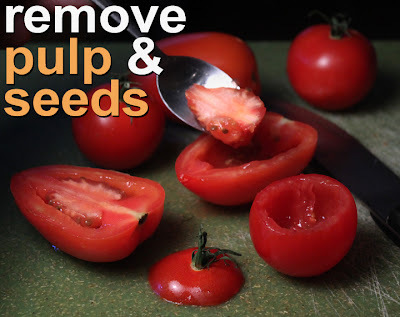 Cut length wise (for Italian,) or just lop off the tops (for tomatoes that will not tip over) and scoop out seeds. 1/2 package or 1/2 bunch of spinach - roughly chopped, about 3 cups. 3/4 cup of breadcrumbs - okay to use a little more or less. 1/2 small package of cheese - about 3 ounces. Again, okay to use more or less. Any favorite cheese - I used mozzorella. 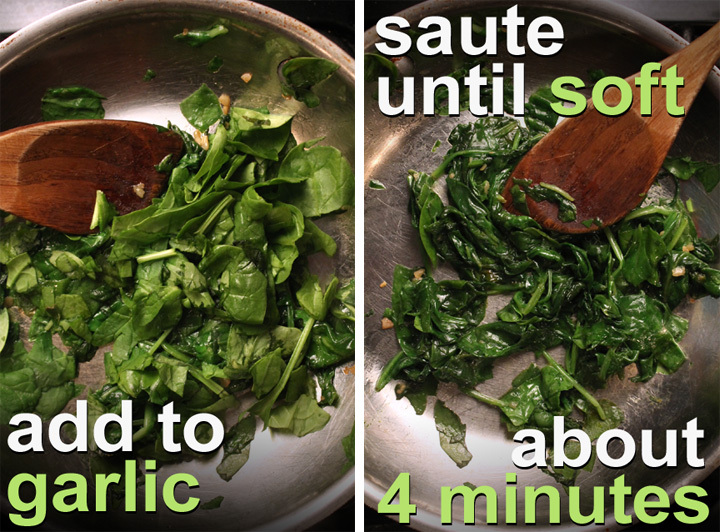 2 teaspoons oil - one for sauteing spinach, and the other to coat roasting pan. Clean and roughly chop spinach, about 3 cups worth. Add teaspoon of oil and chopped garlic to pan. Saute over a medium heat for a minute. Add chopped spinach, stir and cook unit wilted and soft. 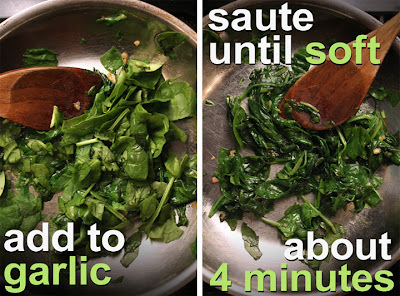 Should take 2-4 minutes. Go ahead and prep the tomatoes while the spinach cooks. You can slice tomatoes a couple of ways: lengthwise for tomatoes that will not sit upright like Italian tomatoes. 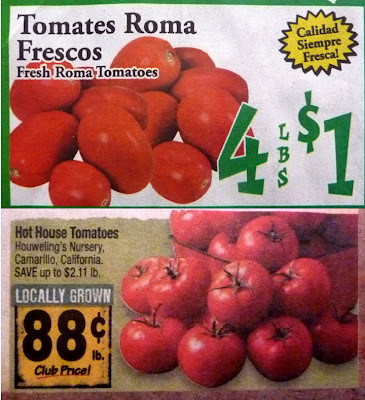 or narrow types; or you can just lop off the top of more wide and squat tomatoes. Now time to bring it all together. In a bowl add cheese, breadcrumbs and spinach. Mix well. You can use pre-made breadcrumbs or make your own. (Just click here to see how I do it with 2 slices of bread.) Depending on the size of your tomatoes, you may need some more of these ingredients -- it's easy enough to make a larger batch of stuffing. 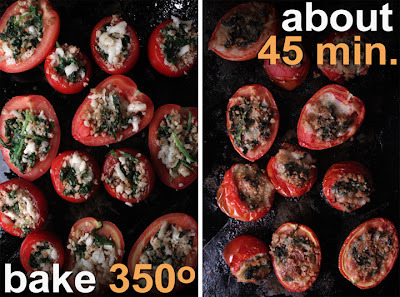 Fill each tomato cavity with cheese, spinach and breadcrumb stuffing. Go ahead and carefully pack it in. Since tomatoes are high in sugar, they may stick to baking pan. I used an oil spray to coat my baking cookie sheet, you could just drizzle a teaspoon of oil and rub it over the surface. Arrange the Stuffed Tomatoes on the pan. 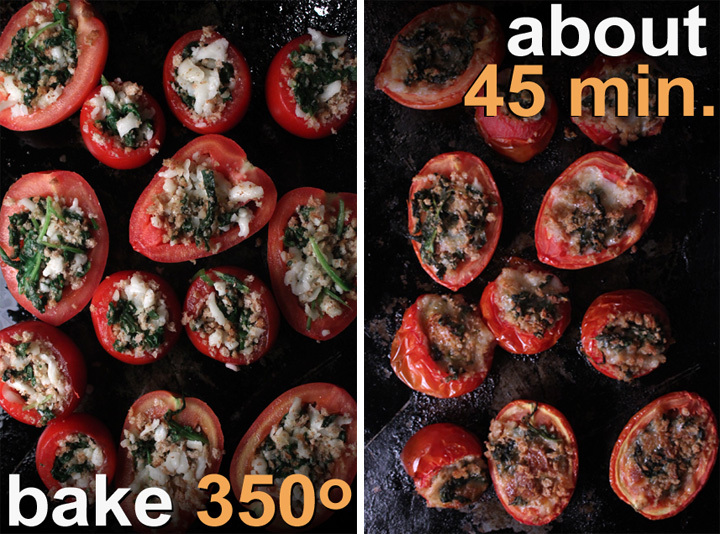 Bake the Stuffed Tomatoes for about 45 minutes at 350 degrees. Done when the tomato skin wrinkles and the tomatoes begin to collapse. The cheese and breadcrumbs will lightly brown. Very hot when done so let them set a minute, then dig in! During baking a couple of the tomatoes with tops cut off tipped over and the stuffing started to run out. I carefully made them right before the cheese melted out. So be sure to check about half way though baking and straighten any tomatoes that fall over. 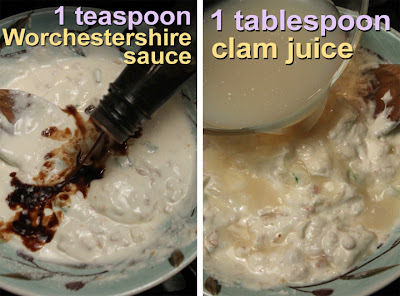 You can also use ground beef, turkey or chicken mixed into the stuffing for hardier fare. 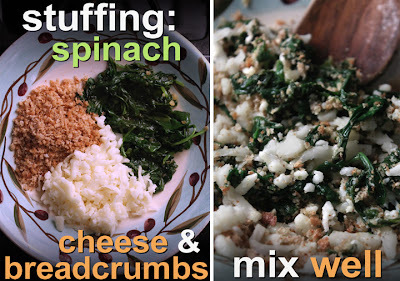 If you like a cheesy stuffing then add more of it - same thing if you want more spinach. Since tomatoes come in such unpredictable sizes, you may need more or less stuffing, but the stuffing mix is easy enough to expand. This recipe is easy to double when you get a bountiful harvest of tomatoes, or if you are luck enough to have a farmers market or roadside stand that carries locally grown tomatoes. I was ready to eat up this Deal of the Day, but after a couple of bites, it was a struggle to finish even one the the two Sweet Corn Tamales by Eco Tropicals. 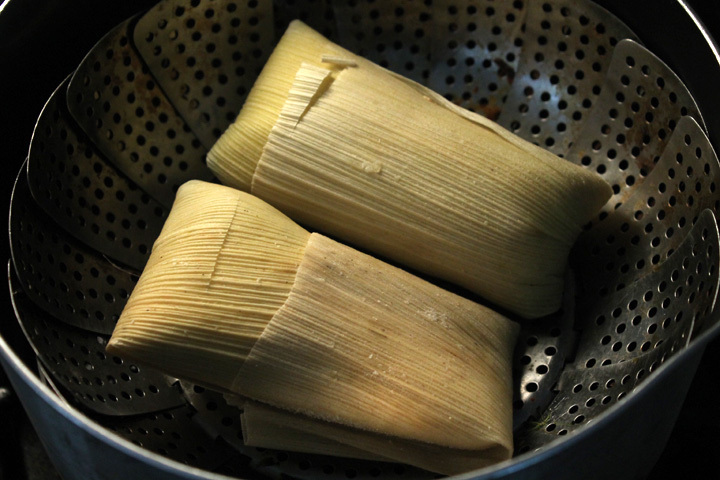 Number one, a tamale should not be dry and powdery, but moist and spongy. 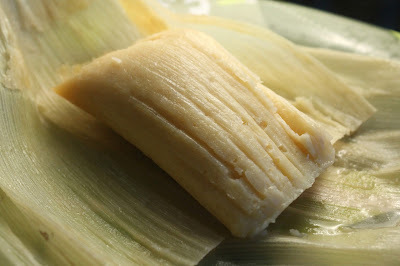 The Sweet Corn Tamale I tried looked promising when I unwrapped it (after steaming for 10 minutes) -- visually appealing, plump and spongy to the touch. However when I sliced into it with my fork the texture was like sawdust. And my first taste was off-putting; I expected a moist chopped corn texture, not dry and crumbly. 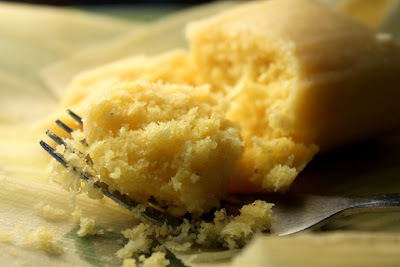 Plus the sweet flavor of cooked corn was lost in a masa (dough) that tasted astringent and slightly metallic. I thought it could come from freezer-burn, but since the tamales are well wrapped in corn husks I think the ingredients were just off. The tamales are from Ecuador (according to the package.) I had high hopes, thinking if their coffee is renowned then maybe their tamales are too. (I'm sure their tamales are great, just not these packaged ones.) 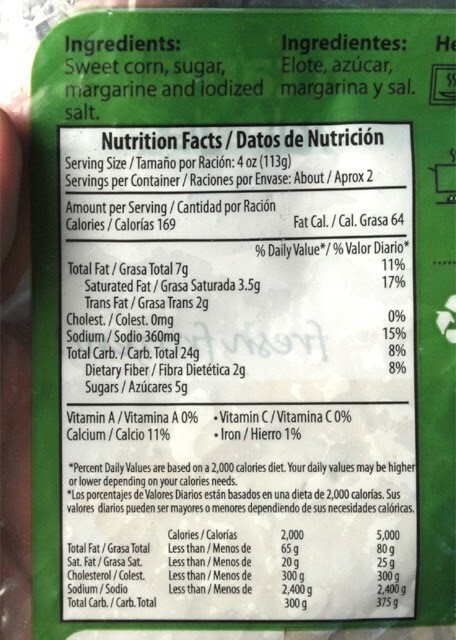 Only four ingredients are listed on the package: sweet corn, sugar, margarine and salt. I think they left out a few things, or maybe the margarine was bad tasting to begin with. I decided to finish at least one, to make sure my first impression was right -- unfortunately it was. Each bite was just as bad as the next. Since I only bought one package I can't rule out that it was the fault of poor storage. But I'm too cheap to buy another package. 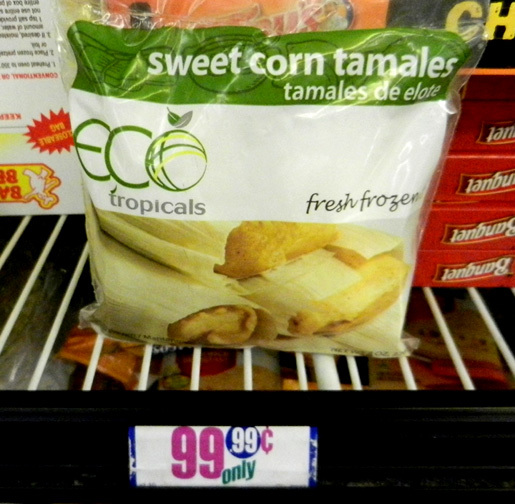 So, on The 99 Cent Chef's rating scale, 9 being best, I give Sweet Corn Tamales by Eco Tropicals a lowly 2. I visited their website listed on the back of the package (click here,) but found no cooked products listed, only fresh fruit. 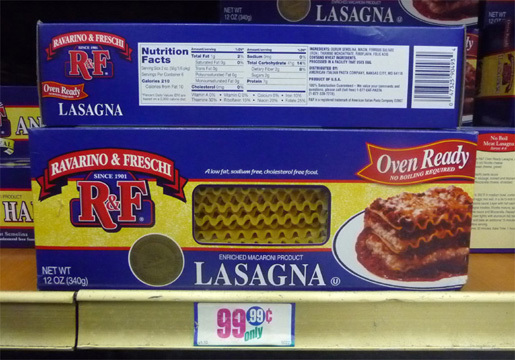 Talk about patience, I've been on the lookout the last couple of years for packages of lasagna for 99.99 cents, so I could make a budget lasagna. 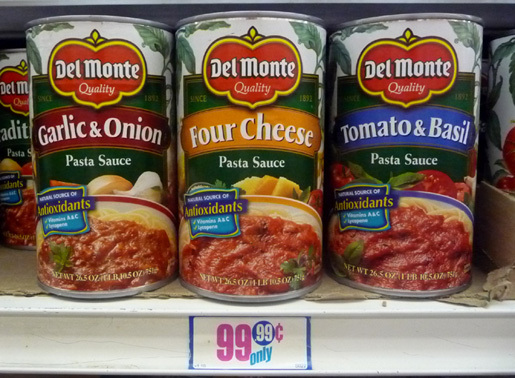 Finally I picked up a few boxes at this Hollywood 99c only Store, along with some ground chicken, 2 containers of cottage cheese, and a large can of Del Monte 3 Cheese Spaghetti Sauce. Now I'm finally ready to make a Baked Lasagna with Ground Chicken...so let's get cooking! 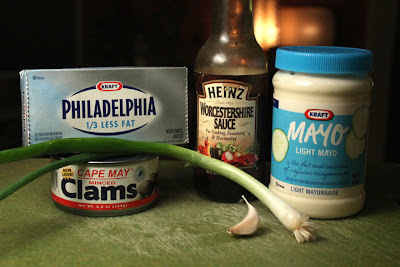 The rest of the ingredients are things I always have around, including: dried parmesan cheese in a can, a few half-used small packages of shredded cheese stored in the freezer, a large onion, a jar of chopped garlic, and some fresh herbs from my garden. 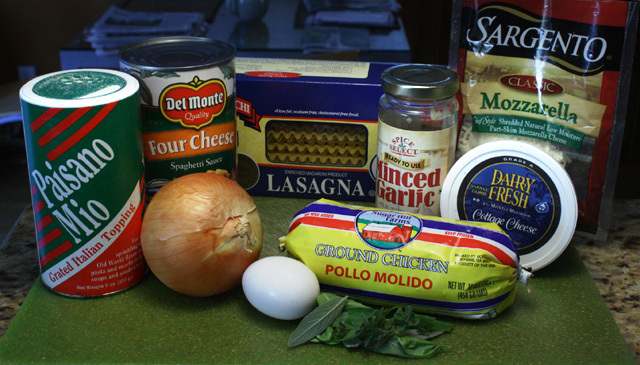 Just very basic stuff for a simply delicious meat lasagna. 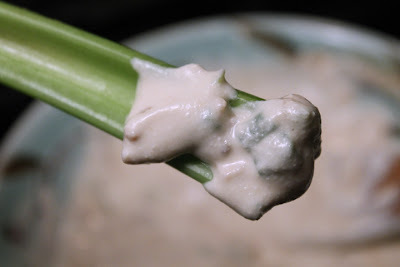 And this recipe is Wife Approved, by my number one taste tester; her only recommendation to me was to chop the onion a little finer next time, and this recipe is so delicious there will be a next time -- soon. I used inexpensive ground chicken, but you could also use ground turkey, beef, or pork. 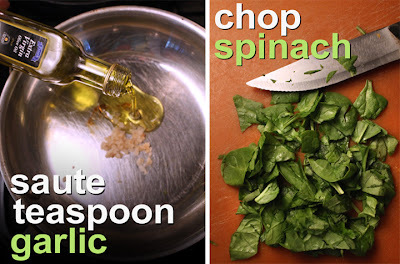 For a vegetarian version substitute the meat with a couple of washed and sauteed bunches of spinach. A traditional lasagna calls for a tub of creamy ricotta cheese, but I've found that cottage cheese is a cheap and tasty substitution. (I do, on occasion run across ricotta on sale.) Once the assembled lasagna is baked, the cottage cheese melts just like any other cheese. 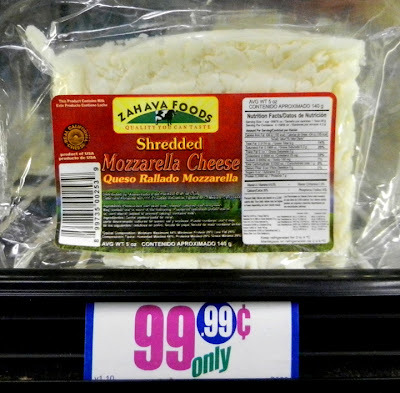 It's milder, so I supplement with a little dried parmesan, mozzarella and cheddar cheese -- now that's a lot of flavor. You will also need a large baking pan (and aluminum foil,) or a couple of covered baking dishes. Of course you could just cut the ingredient amounts in half, if all you have is a single oven proof bowl. You can feed your brood and still have leftovers with The 99 Cent Chef's latest hearty entree. And if you are single, then throw a Lasagna Party! (It also freezes well to pack for a few work lunches.) 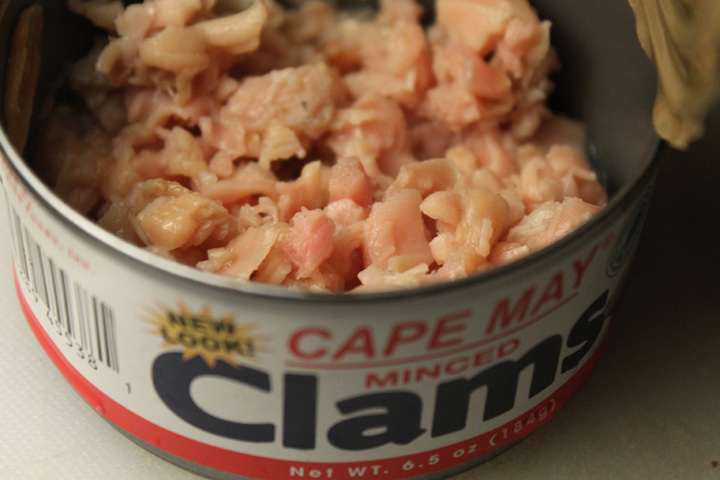 And, if you are looking for a great Pot Luck dish, this is it. 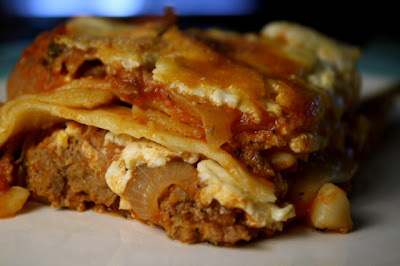 My Baked Lasagna with Ground Chicken is a recipe you will want to pull out on a cold Winter day. 26 ounces tomato sauce - any favorite. Or two 15 ounce cans. 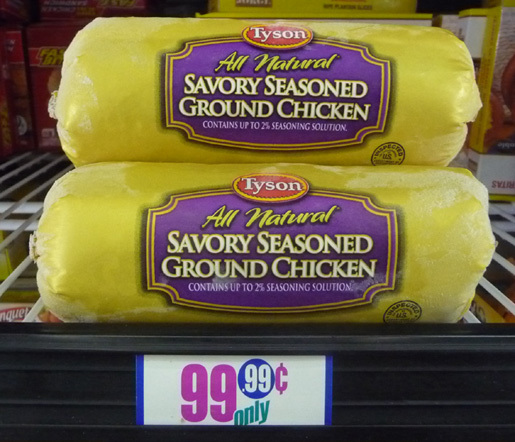 1 pound ground chicken or turkey - okay to use ground beef or pork. 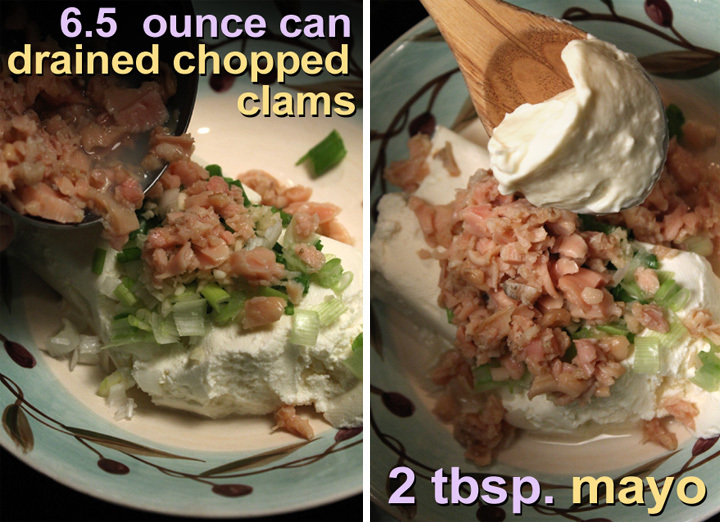 16 ounces of cottage cheese - I used 2 small containers. Okay to use ricotta cheese. 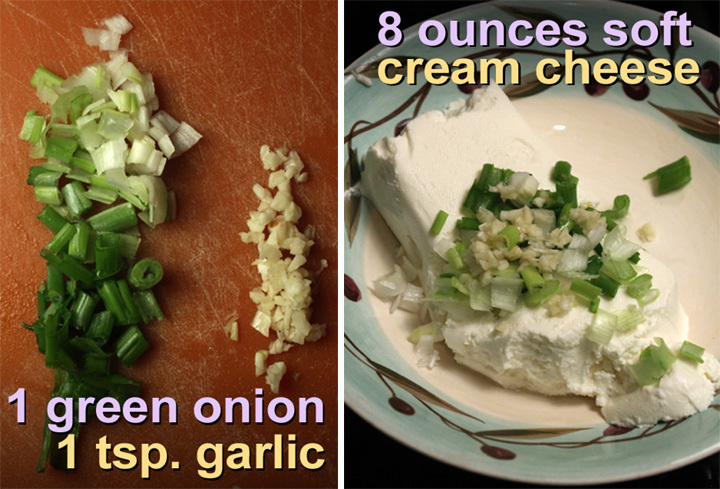 Add another 8 ounces of cottage cheese for a richer version. 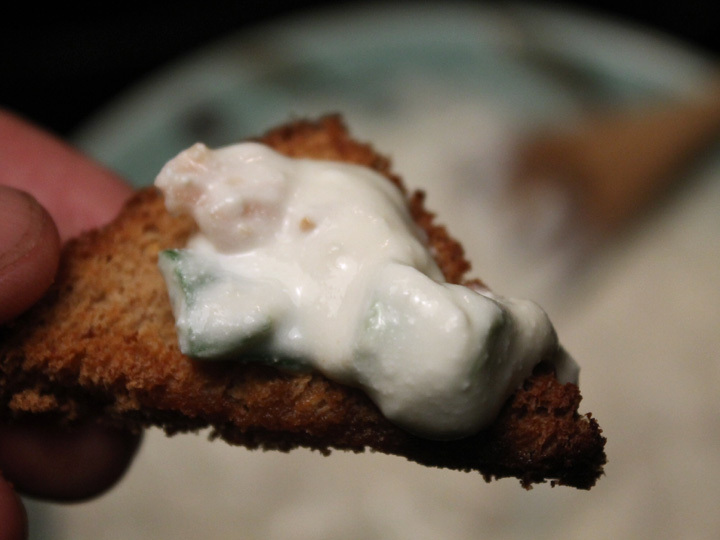 6 to 12 ounces of mozzarella cheese - or any extra cheese you have on hand for the topping. 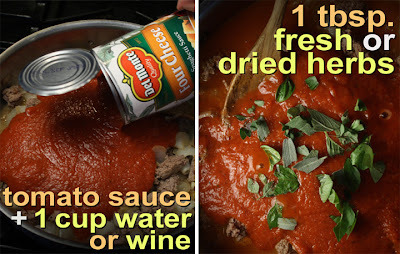 1 cup of water - to rinse out tomato sauce cans, adding every drop of sauce. Use red or white wine for a luscious sauce -- the alcohol cooks out. 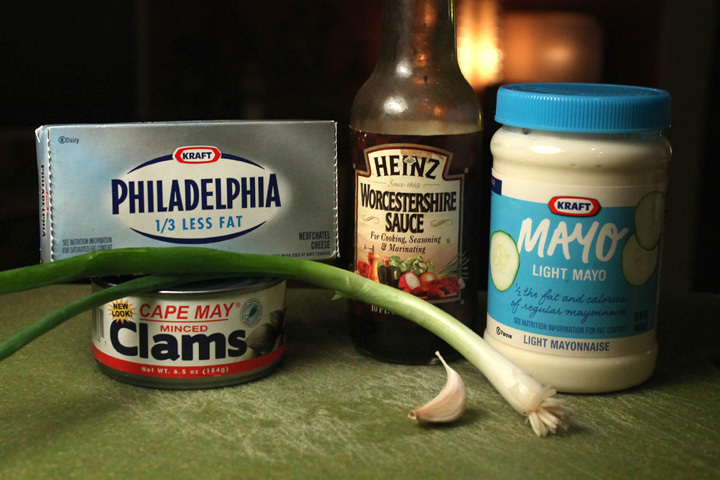 1 whole onion - rough or fine chopped. 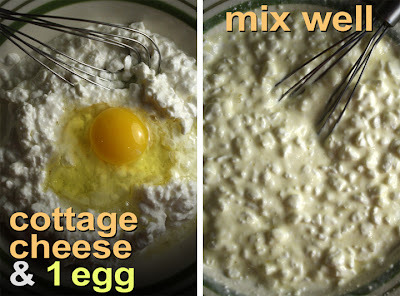 1 egg - to mix into cottage cheese. A few tablespoons of dried parmesan - optional. Okay to use fresh grated. 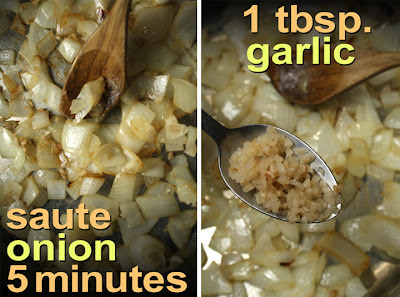 2 tablespoons oil - One to saute onion and another to grease the baking pan. 1 tablespoon chopped herbs - fresh or dried including: basil, oregano, sage, and parsley. Okay to use an Italian dried herb mix. Add oil to a large pan or pot over a medium heat. Add chopped onion and saute until soft, about 5 minutes. Add chopped garlic and saute for a minute. While onion is sauteing, you can start boiling water for the lasagna. Follow package directions to cook the lasagna. If pasta is ready before meat sauce, then drain, rinse with cold water, and drizzle with a tablespoon of oil to keep it from sticking together. Scoop in ground meat to the sauteed onion and garlic and spread it out. I like to let it firm up for about 3 minutes, then break it into bite-sized chunks. Continue to cook the meat until it is done, about 5-10 minutes total. Pour in tomato sauce and the extra cup of cup of water (or wine) that was sloshed in the emptied tomato cans. Sprinkle on the chopped fresh or dried herbs. Mix well and heat through about 5 minutes. 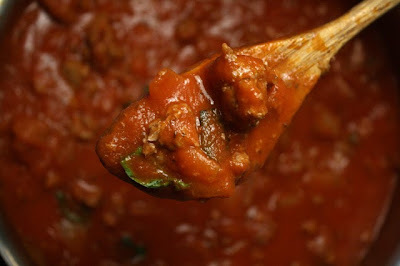 This is a typical meat pasta sauce. If you have your own favorite pasta sauce recipe (pre-made canned or bottled) then use that. While meat sauce is cooking you can prepare the cottage cheese sauce. 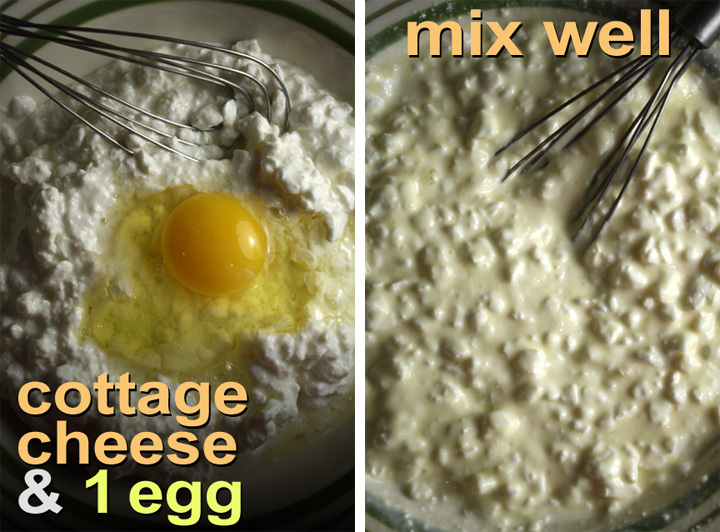 Just add the cottage cheese to a bowl and break in an egg. Mix it well. Now time to put it all together. Start the oven preheating to 375 degrees. I used a metal baking pan that is about 9x13 inches, and 2 inches deep. If you don't have a large pan, this recipe is easy to half into a couple of pans or baking dishes. You may need to fold (or cut) cooked lasagna noodles in half for an easier fit. Grease the bottom of the baking pan with a little oil or oil spray. Add a couple layers of cooked lasagna. Next pour on about a third of the meat sauce. Then spread on about a third of the cottage cheese. You can use any extra cheese you have, including dried parmesan, mozzarella and cheddar. Repeat another layer of lasagna, meat sauce and cottage cheese. Finally top with mozzarella, parmesan and/or any favorite cheese. Make sure to not fill the pan all the way up, as the sauce may boil over -- just to be safe, put a wide cookie sheet or extra foil underneath the lasagna pan. Cover assembled lasagna pan with foil. Bake at 375 degrees for 30 minutes. Now time to brown the top. Carefully remove the foil (it's hot,) reduce the oven heat to 350 degrees, and cook another 15 minutes until the cheese is lightly browned. Remove from the oven and allow set a couple of minutes, then dig in. 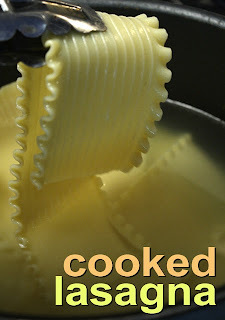 If you are worried about pasta sticking to bottom of baking dish, then add more oil to pan, or add a thin layer of sauce. My lasagna dish is just a basic recipe. There are many variations you can do. First, you can make more tomato sauce if you like it that way. 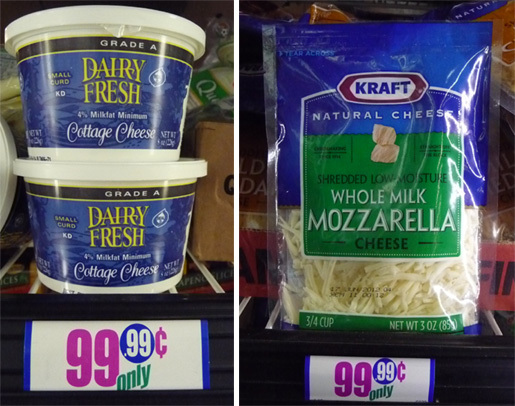 And, of course, you can add more cottage and regular cheese for a richer entree -- you can never have too much cheese. For a vegetarian version, leave out the meat and add 2 cleaned and roughly chopped bunches of spinach to the sauteing onions. And just layer it in with the cottage cheese. Almost any cooked veggies will work, including sliced squash, and florets of broccoli and cauliflower. If you like your veggies with some crunch, then just layer them in raw just before baking. My meat sauce can be kicked up a notch by adding a cup of red or white wine. Again, if you have a favorite Italian pasta sauce then use it. If dried lasagna is too expensive then substitute with cheaper spaghetti, or any cooked pasta. The cheese, meat or veggie tomato sauce, goes with all types of pasta.